--Figure 14-8 The arterial pulse. Figure 14-7 Physiologic splitting of the second heart sound. compliance and capacity of the arteries, and the pressure waves that result from the antegrade flow of blood. Figure 14-8 illustrates a characteristic arterial pulse. As the arterial pulse travels to the periphery, there are several changes. The initial upstroke becomes steeper, the systolic peak is higher, and the anacrotic notch becomes less evident. In addition, the dicrotic notch occurs later in the peripheral pulse, approximately 300 msec after the onset of the pulse. The positive wave that follows the dicrotic notch is called the dicrotic wave. Commonly, two waves may be present in the arterial pulse, which precedes the dicrotic notch. The percussion wave is the earlier wave and is associated with the rate of flow in the artery. The percussion wave occurs during peak velocity of flow. The tidal wave is the second wave, is related to pressure in the vessel, and occurs during peak systolic pressure. The tidal wave is usually smaller than the percussion wave, but it may be increased in hypertensive or elderly patients. 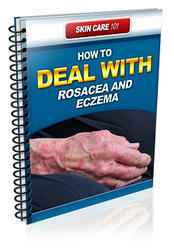 Rosacea and Eczema are two skin conditions that are fairly commonly found throughout the world. Each of them is characterized by different features, and can be both discomfiting as well as result in undesirable appearance features. In a nutshell, theyre problems that many would want to deal with.